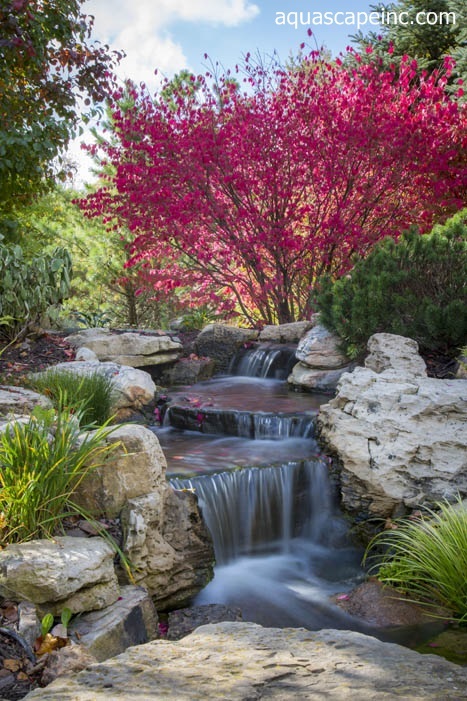 A gorgeous burning bush sets a colorful backdrop for this lazy waterfall. All of the water features I’m showing you were created by our team of installers and it’s hard to believe they’re man-made. They look so natural, as though they’ve been there forever. A closer look shows how pretty the red and yellow leaves look in the water. At the top of the waterfall is a “spillway bowl” that’s pouring water into the falls. Careful placement of plants help to soften the rocky edges. The sound of waterfalls is so soothing and relaxing. 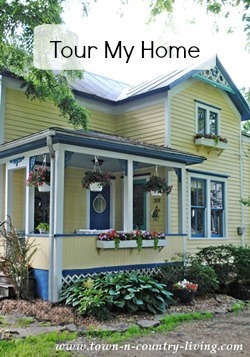 Everyone should have one in their yard (of course, I’m a bit partial). 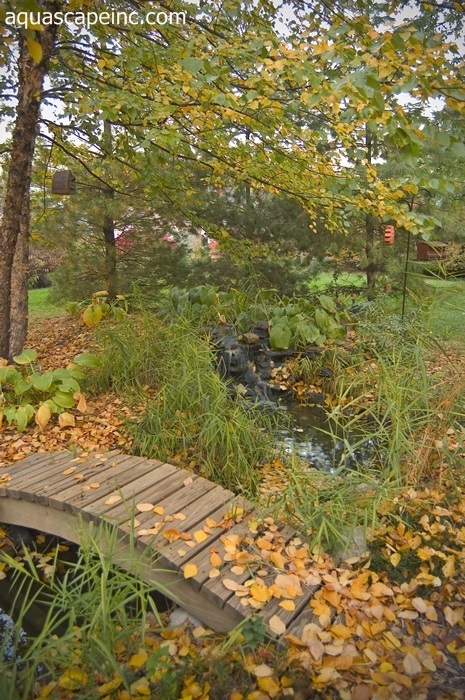 This gorgeous fall landscape, complete with pond and colorful koi, graces the backyard of one of my co-workers. 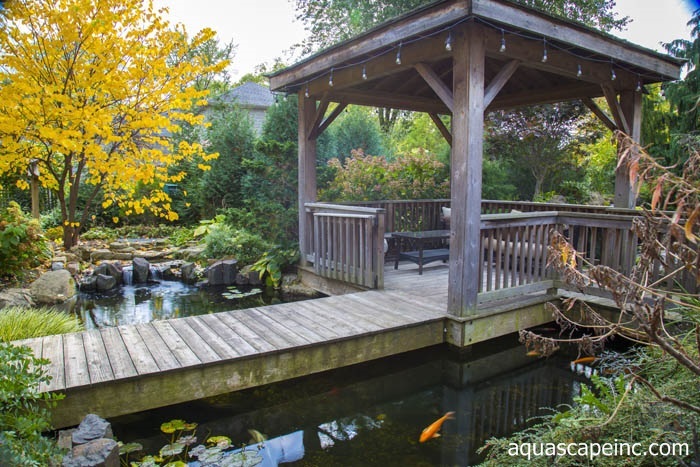 The gazebo appears to be floating on the water and creates a peaceful retreat from the world. On the other side is what we call a Pondless Waterfall. Basically it’s a waterfall without a pond. The water is stored in a sub-surface reservoir and keeps recirculating up and over the falls. Isn’t it pretty? 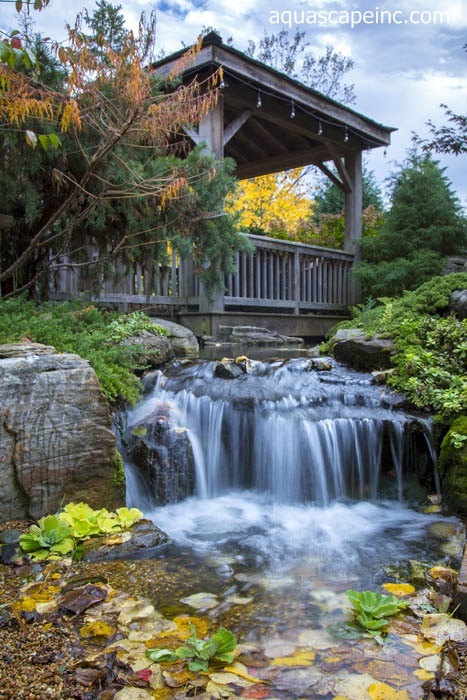 This fall landscape is located in a suburban backyard just outside of Chicago. Another waterfall in a fall landscape features bright yellow leaves cascading over the waterfall drops. Although our ponds and waterfalls look gorgeous in the summer with their waterlilies and lotus, I love the way they look during the autumn season, too. Look carefully and you’ll notice this is actually a fairly long waterfall. 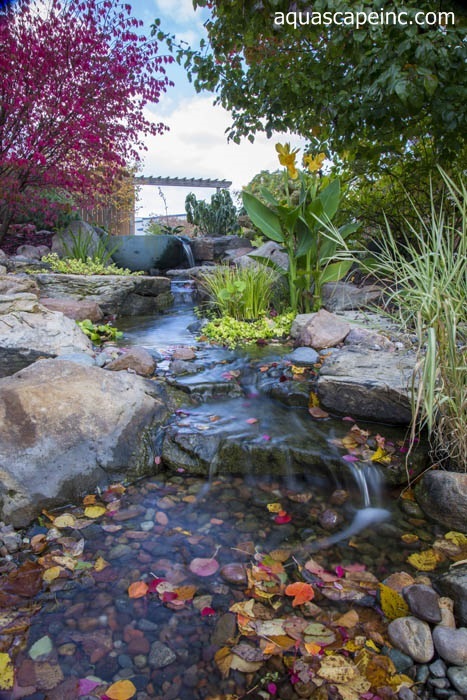 One thing our installers like to include with a water feature is some type of bridge. It invites you to cross the water and explore further. I really shouldn’t call them “installers.” I think you can see they’re truly artists using rock and water as their artistic medium. This expansive pond graces the front of the building where I work. The waterfall to the left is 10-feet tall and has a little surprise. There’s a grotto behind it. One day I’ll share pictures of it. 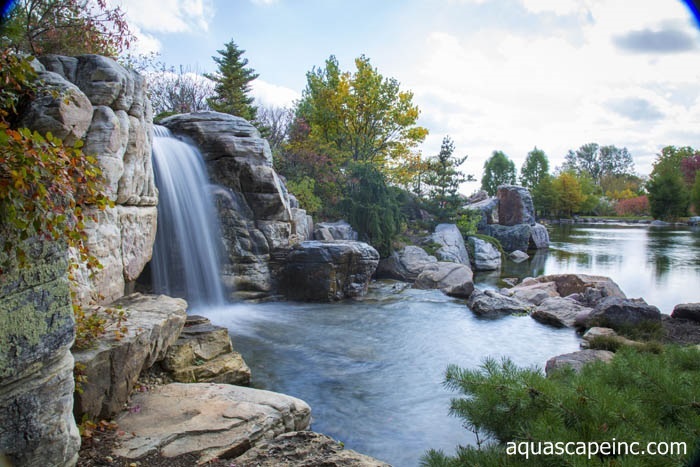 This entire feature was built by our team along with several of our Certified Aquascape Contractors from across the country. 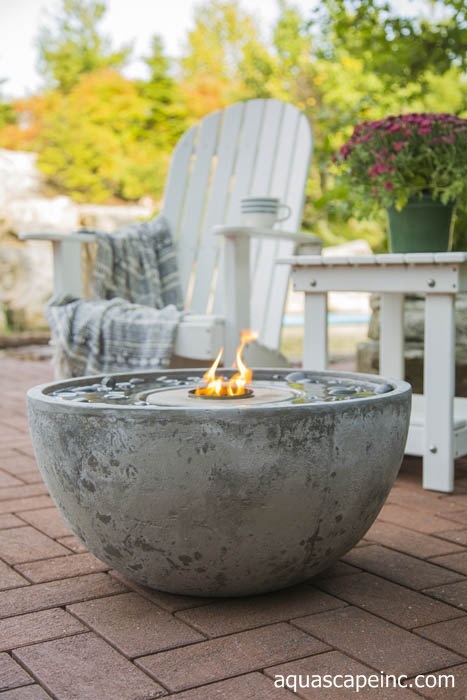 We also have smaller water features like our charming Fire Fountain. I helped style this photo shoot; that’s my coffee mug and cozy throw. Lisa took the pictures. She always does a great job. A close-up view shows the details of the Fire Fountain. The water is continuously moving and makes such a pretty sound. 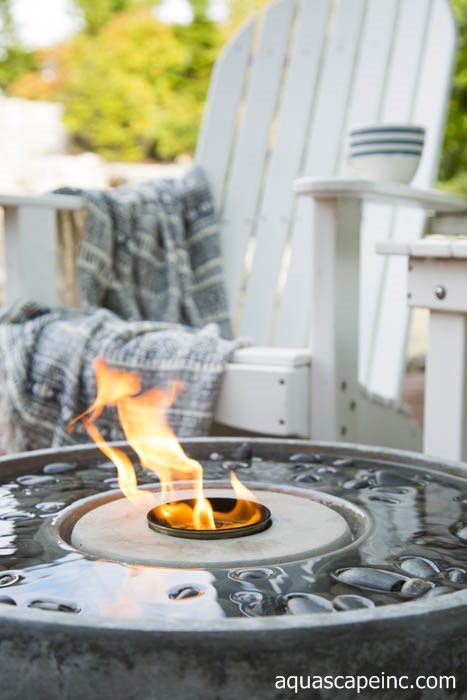 Fall is a perfect time to enjoy this feature that pairs fire with water. 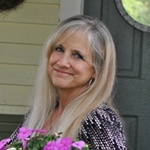 Lisa created a fun video that shows how easy it is to set up the Fire Fountain. 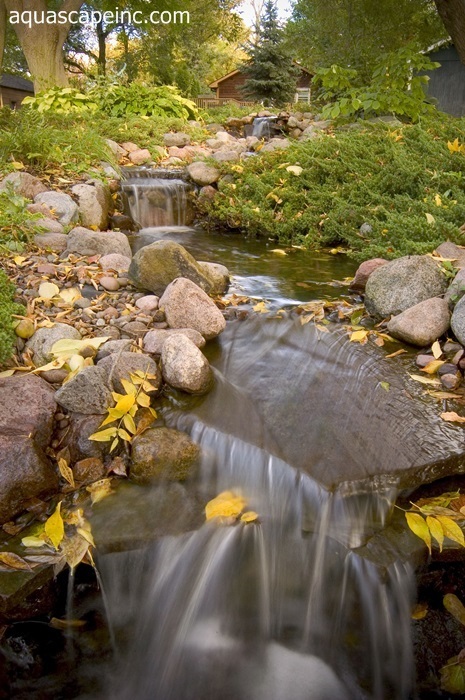 I hope you enjoyed these fall landscape features showcasing a splash of water. I’m grateful I get to work with such beauty each and every day. 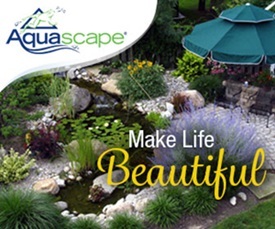 Do any of you have a water feature in your yard? I’d love to hear what you love most about it. 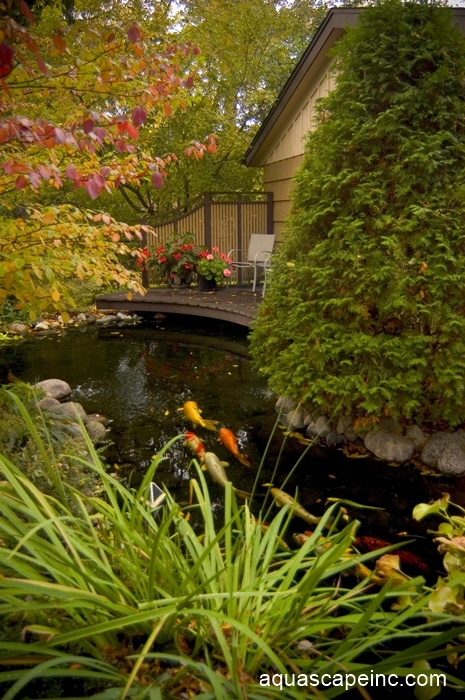 WHY ARE ALL ARTICLES SAY THAT NEARLY EVERY POND IS ALWAYS IN THE BACK YARD?